The quadrants of the screen represent: color vision without brightness information (equiluminance), motion, face detection and edge detection. I’ve learned a lot of interesting things in the process, not just about the human visual system, but also how difficult it is to accurately represent color using digital media. The project relies on a lot of the reliability and ease-of-use techniques that I’ve developed for use in art projects. 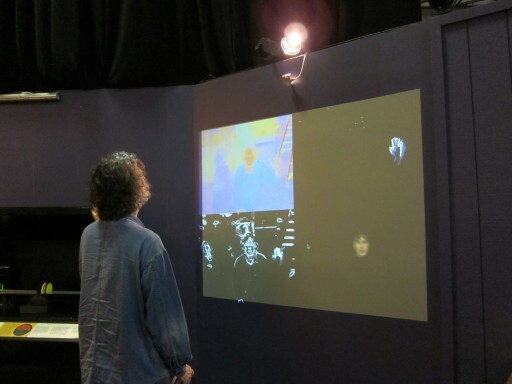 The installation is all built in Max/MSP, and relies heavily on the OpenCV computer vision library, in its cv.jit incarnation. It’s currently in “soft launch” mode, check it out in the “Seeing” exhibit.